Everyone is encouraged to grab a rod, get outside and take advantage of Maryland’s excellent angling opportunities during free fishing days June 6, June 13 and July 4. No license or trout stamp is required to recreationally fish in state waters on these days. Maryland also features 23 unique license-free fishing areas, where anglers can fish without a license throughout the year. As always, anglers must adhere to regulations, including size and possession limits, which are available online in the digital 2015 Maryland Fishing Guide. Printed copies of the guide are offered at most Maryland tackle shops and at the seven regional DNR Service Centers. Anglers 15 years old and younger do not need a license to fish year-round. The Department of Natural Resources invites young anglers to keep up-to-date on youth fishing events by joining the free Maryland Youth Fishing Club. 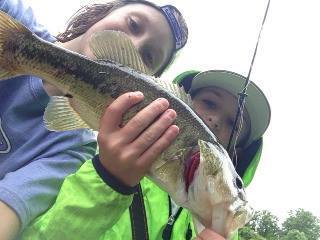 DNR also hosts an active online Maryland Angler’s Log where anglers of all ages share their photos and fishing experiences. Anglers looking for fishing guides or charters should visit the Map of Licensed Charter Boats & Fishing Guides to find a nearby pro. While you are fishing, keep in mind that catching a fish meeting or exceeding the minimum Angler Award size for that species will earn you a certificate and an invitation to the Maryland Fishing Challenge Finale at Sandy Point State Park in September, where you may win a prize. To enter, simply take your fish, or a clear photo of your fish if you released it alive into the water, to an Angler Award Center (participating tackle store) to have the species and size confirmed and to receive your ticket and registration information. Catch and Release entries require a photo clearly showing the length of the fish measured on or next to a measuring tape. 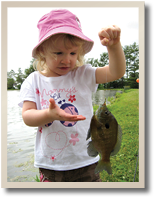 Categories: Free Fishing, Maryland | Tags: Department of Natural Resources, Family Fun, Free Fishing, Kids, Maryland, Maryland Angler's Log, Maryland DNR, Maryland Fishing Challenge, Maryland Fishing Guide, Maryland Free Fishing Days, Maryland Youth Fishing Club, Outdoor Adventures | Permalink. Free Fishing Day & License Free Fishing Areas in Maryland! You are required to observe all other fishing laws and regulations. A free MD/PRFC angler registration is also required for anglers fishing without a license in designated license free fishing areas, you may register online through dnr.maryland.gov/service/fishing_license.asp. •Annapolis–Maryland Route 450 old bridge at the Severn River. •Cox’s Point on Back River and Deep Creek. Directions: Eastern Blvd. (Rt. 150) to Riverside Drive south. • Hull Street Recreational Pier – Directions: Key Highway to Hull Street north. •Denton–Pier associated with G. Daniel Crouse Memorial Park on the east side of Choptank River north of Maryland Route 404 Bridge. • Charlestown–Town-owned stone wharf on the Northeast River near the corner of Conestoga and Water Streets and the historic site of Charlestown Wharf. •North East–North East Community Park at mouth of North East Creek. • Friendship Landing–County-owned pier and property adjacent to the pier off Friendship Landing Road southeast of Ironsides Riverside Road (Rt. 425) on Nanjemoy Creek. •Cambridge–Long Wharf from south end of city-owned bulkhead associated with the Municipal Yacht Basin within Cambridge Creek to the end of east breakwater at mouth of the Municipal Yacht Basin. •Havre de Grace–Tydings Memorial Park within designated area, and pier at the end of Congress Street. • Chestertown–Maryland Route 213 Bridge over Chester River. •Worton–Bridge No. K-004 over Still Pond Creek on Still Pond Creek Road near Chestertown. •Princess Anne – The Manokin River Park along approximately 350 feet of the south bank of the Manokin River west of the bridge at Somerset Avenue and the west side of that bridge. •Sharptown–Pier and town dock off Ferry Street on the Nanticoke River. •Salisbury–Designated city-owned bulkhead on the Wicomico River between Mill Street and Division Street. •Tyaskin Park–County-owned park on Wetipquin Creek west of Rt. 349 at Tyaskin. •Pocomoke City–County-owned dock at Cedar Hall Landing near western terminus of Route 371 on Pocomoke River. •Pocomoke City–City docks from Laurel Street boat ramp to U.S. Route 13 overpass and Winter Quarter dock on Pocomoke River. •Snow Hill–County bridge on Porter’s Crossing Road west of U.S. Route 113 and east of Route 354 and Pocomoke River. •Snow Hill-All city-owned riverfront property which includes Byrd Park, Sturgis Park, and city bulkheading adjacent to the municipal parking lot near the Route 12 bridge over the Pocomoke River. •Ocean City – Northside Park – Town-owned pier and park at 125th Street. •Ocean City – Chicago Avenue – Bulkhead between 2nd and 4th Streets. 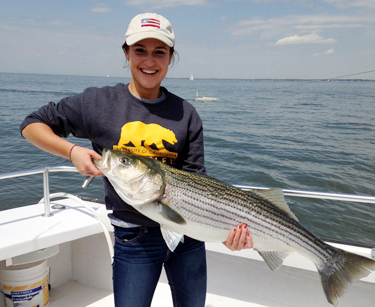 Friday, July 4 is the last of 2014’s three license-free fishing days in Maryland. No fishing license or trout stamps are required to fish on these days. Take a friend and your kids and just go fish. Categories: Free Admission, Maryland, Sports | Tags: Family Travel, Fishing, Free Fishing, Free Fishing 4th of July, Free Fishing in MD, Kids, License Free Fishing Areas, License Free Fishing Areas in Maryland, Maryland, Mid Atlantic Region, Mid Atlantic States, Mid Atlantic Travel, Outdoor Adventures, Sports | Permalink. Saturday and Sunday, June 14 and 15, will be New Jersey’s Free Fishing Days in 2014. Free Fishing Days are held annually in conjunction with National Fishing and Boating Week, and on these days fishing is allowed on the Garden State’s public waters without a license or trout stamp. All other regulations, including size and daily catch limits, remain in effect. New Jersey’s two Free Fishing Days are a no-risk investment for an introduction to freshwater fishing in the Garden State and the perfect time for families to enjoy two days of outdoor fun for free. Though youngsters under the age of 16 don’t need a license, these days provide a special benefit to adults who can join in the fun without having to purchase a license. That is, until they get hooked on a sport that just might become a lifetime of fun for the whole family. Free Fishing Days also provide a great opportunity for out-of-state visitors to sample some of the finest freshwater fishing opportunities in the Northeast. Categories: Free Admission, New Jersey, Sports | Tags: Family Travel, Fishing, Free Fishing, Free Fishing in NJ, Kids, Mid Atlantic Region, Mid Atlantic States, Mid Atlantic Travel, New Jersey, Outdoor Adventures, Sports | Permalink. Anglers have several opportunities to fish without a license in Maryland. Normally a license is required to Fish in Maryland but there are a few exceptions to this requirement. The first is there are specific areas in Maryland that are designated License Free Fishing Areas throughout the tidal portions of the Chesapeake Bay. You are required to observe all other fishing laws and regulations. A free MD/PRFC angler registration is also required for anglers fishing without a license in designated license free fishing areas, you may register online through dnr.maryland.gov/service/fishing_license.asp. The second option is that Maryland hosts Free Fishing Days. During a free fishing day, a person may catch and possess finfish in the tidal and nontidal waters of the State for recreational purposes without an angler’s license, Chesapeake Bay sportfishing license, or any fishing stamp normally required by the State, but shall otherwise observe all fishing laws and regulations. Maryland’s free fishing days are the first two Saturdays in June and July 4. In 2014, that’s June 07 & 14 and July 04. Lastly, all those folks under 16 years of age are allowed to fish without a license. Categories: Free Admission, Maryland, Sports | Tags: Family Travel, Fishing, Free Fishing, Free Fishing in MD, Kids, Maryland, Mid Atlantic Region, Mid Atlantic States, Mid Atlantic Travel, Outdoor Adventures, Sports | Permalink. Photo Courtesy of the West Virginia Department of Commerce. West Virginia’s Free Fishing Days are June 7 and 8, 2014. 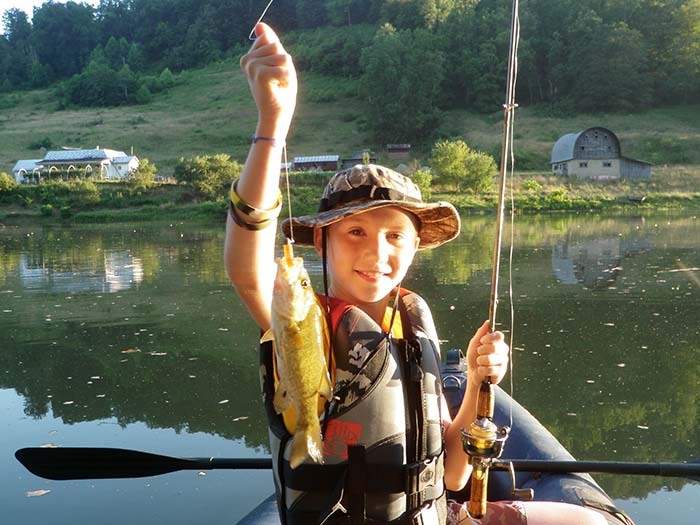 National Fishing and Boating Week 2014 will be highlighted by the 24th annual Free Fishing Weekend June 7-8, according to Frank Jezioro, Director of the West Virginia Division of Natural Resources (DNR). During these two days, residents and nonresidents can fish in West Virginia without a license. “It is a great opportunity to remind people of the fun of fishing, especially with family and friends. If you already have a license, take someone fishing — it may be your children, spouse or co-worker – and introduce them to a lifetime of outdoor enjoyment,” Jezioro said. 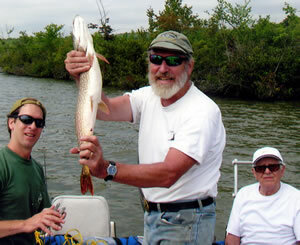 DNR participates in a number of activities during National Fishing and Boating Week and Free Fishing Weekend. One of the largest and most successful events is the Bowden Fishing Derby that will be held June 7 at the Bowden Hatchery in Randolph County. Children must register for the event, and they will receive basic fishing instruction and will have the opportunity to enjoy time fishing with friends and family. Registration information for the Bowden Derby can be found at http://www.wvdnr.gov/2014%20Derby%20Flier.pdf. National Fishing and Boating Week began as a promotional activity sponsored by the sportfishing industry, encouraging fishing around Father’s Day. The recreational boating industry partnered with its sportfishing counterparts to develop a fishing and boating educational campaign. Categories: Free Admission, Outdoor Adventures, West Virginia | Tags: Bowden Fishing Derby, Family Travel, Fishing, Free Fishing, Free Fishing West Virginia, Kids, Mid Atlantic Region, Mid Atlantic States, Mid Atlantic Travel, National Fishing & Boating Week, Outdoor Adventures, Sports | Permalink.